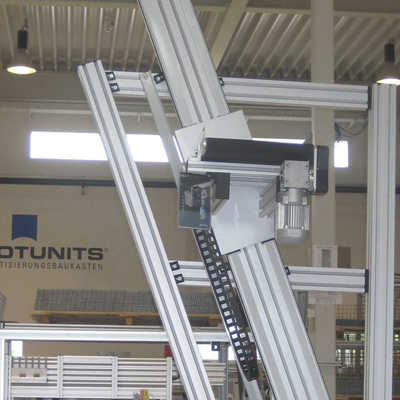 Robotunits Lifters combine our proven Linear Motion Units with our Conveyors. Height differences in production and warehousing environments can easily be overcome by utilising this clever technology. Robotunits Lifters are built by combining Robotunits aluminium extrusion, fastening as well as conveyor and linear motion technology. Due to this fact we can produce customer specified Lifters very quickly saving valuable time and therefore saving bottom line dollars for our customers. Choose height, width, carriage size and conveyor options depending on your exact needs. Lifters can be built to almost any requirements in vertical or angled configuration. 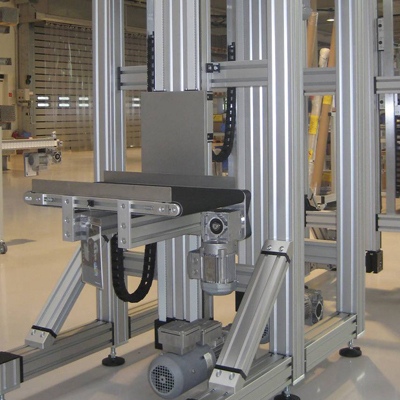 Easily transferring goods to different height and utilisation of the available warehouse height are just two of the benefits of using Robotunits Lifters. The Units integrate with the complete Modular Automation System which results in substancial cost and time savings. Safety enclosures can be added depending on your needs and site specifications also.